Exfoliate and hydrate your skin with the best natural biodegradable particles. The Revitalising Body Scrub improves cell renewal and skin texture with the combined action of bamboo powder and raspberry seeds. It incorporates a high moisturizing power thanks to high concentration of top-quality vegetable oils such as jojoba oil, avocado oil and almond oil. It also contains burdock and aloe extracts that stimulate the elimination of toxins. Its natural cherry blossom scent revitalizes body and soul! Natural scent. Its revitalizing Japanese cherry blossom scent will leave your body feeling calm and restored. It exfoliates skin with the perfect combination of medium and fine size biodegradable particles. It stimulates cell renewal and improve overall skin health with aloe vera and burdock extracts. It deep moisturises with jojoba and avocado oils. Extraction: derived from Coconut Oil and Glycerin, is considered an excellent emollient and skin repairing agent. It is a mix of fatty acids. It is not considered a sensitizing agent. Benefits: it repairs the surface of the skin and prevents the loss of moisture and also works to thicken skin. They are neutral oils that do not irritate the skin, are easy to apply and are quickly absorbed. Extraction: almond oil is composed of monounsaturated fats (healthy fats found in plant foods), oleic acid and linoleic acids (such as Omega 3 and 6). It is almost transparent in color with yellow or golden hues and is almost odourless. Benefits: It acts as a stimulant for the production of collagen and elastin, providing the tissues with firmness and elasticity. It reduces the appearance of wrinkles and stretchmarks and sweet almond oil is even recommended in various anti-cellulite treatments. Its anti-inflammatory, reparative and healing properties protect the skin’s natural barrier, slows down the ageing process and protects against UV rays with Vitamin E.
Extraction: bamboo powder is a very light white powder obtained directly from the stem and leaves of the bamboo plant. It is a natural alternative to plastic scrubs. The siliceous bamboo stem is highly purifying, and is an important mineral in our connective tissue, skin, nails and hair. Benefits: the siliceous bamboo stem helps to eliminate the remains of epidermal fat material and, together with other bamboo mineral salts, allows skin cells to recover their functionality. Bamboo powder effectively absorbs excess sebum, leaving oily and combination skin feeling matte and soft. It has antibacterial properties and helps combat acne. Promotes healing and helps to calm and regulate sebaceous glands. Extraction: this ingredient is derived from glycerin and stearic acid, a fatty acid obtained from vegetable oils. It is found naturally in the human body so it will not damage skin. 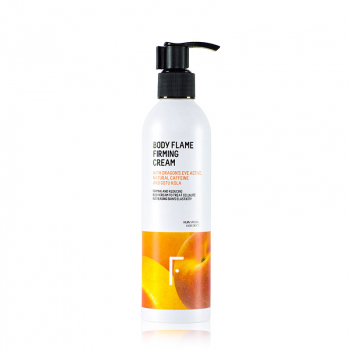 Benefits: acts as a lubricant on the skin’s surface to give it a soft, smooth and light appearance. It also slows down water loss by forming a protective barrier and protects skin against the damage caused by free radicals. Furthermore, in terms of formulation, it helps to stabilize oil-water emulsions by reducing the surface tension of the substances present. Extraction: vegetable oil composed mainly of triglycerides of fatty acids. Benefits: softens and soothes skin, which is why it is used in most cosmetic products. It is an excellent emollient and moisturizer and forms a barrier over the skin to prevent the loss of hydration. Suitable for dry and sensitive skin. Extraction: potassium salt from natural origin with a plant base that acts as emulsifier. Benefits: cleanses and conditions skin and hair. Regulates the skin’s physiological conditions and helps maintain natural pH balance. Extraction: jojoba oil is extracted from the jojoba (Simmondsia chinensis) nut (seed). Actually, it functions more like a wax that is liquid at room temperature than an oil. 96% of its composition consists of ceramides. Benefits: highly moisturizing and nourishing. Ceramides cover the cells of the epidermis and to help regulate and intensify hydration. They are very similar to human skin, which is why they are absorbed and act quickly and are not oily to the touch. Jojoba oil also contains linoleic acid which is a very effective at restructuring and regenerating natural skin. Its vitamin E content also helps to rejuvenate skin and provides defence against free radicals. In addition, it is ideal for oily and acne-prone skin because it absorbs accumulated sebum and helps minimise breakouts. Extraction: raspberry is a wild fruit known as Rubus Idaeus. This ingredient consists of the powder obtained from the raspberry seeds. 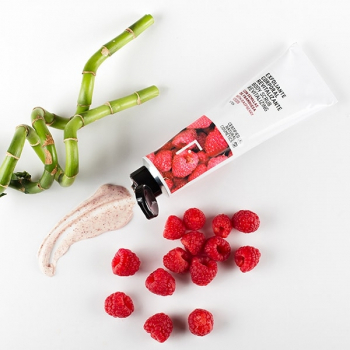 Benefits: Raspberry seed particles work together with bamboo powder to provide deep exfoliation with a slightly larger particle size. The seeds partially absorb the oils found in the exfoliant, making able to soften skin and prevent irritations. The combination of raspberry seeds and bamboo powder create a nice texture consisting of fine-medium grain particles which are perfect for topical use. Extraction: it is a biannual plant of red thorny flowers that is commonly found in Europe. The leaves, roots and seeds of the plant are used, both in natural medicine and in cosmetics. Benefits: burdock’s purifying and detoxifying properties make it great for use as a skin treatment for conditions such as psoriasis, dermatitis, acne, eczema, herpes and eruptive skin diseases. It works as a decongestant and anti-inflammatory, heals damaged skin and helps prevent hair loss. It also has multiple other properties. It’s an antacid, anti-bacterial cleanser, treats oily skin, cleanses the skin and is good for hair regeneration. Extraction: lime, like other citrus fruits, contains a high concentration of vitamin C and flavonoids, which are two class 1 antioxidants. It also contains calcium, potassium and essential oils. The oil extracted from its peel is used in numerous cosmetic products. Benefits: combats skin impurities, making it one of the best astringents. It rejuvenates the skin, keeps it radiant and protects against infections. It also promotes blood circulation making it ideal for treating cellulite. Extraction: grapefruit is a fresh fruit that contains unique phytochemicals known as bioflavonoids. These compounds help promote skin and overall health. Benefits: helps remove impurities and helps strengthen skin, providing luminosity and vitality. Grapefruit extracts are especially beneficial for people who are prone to dandruff, acne, impetigo (bacterial infection of the skin) or skin rashes. On the other hand, it should be noted that grapefruit is very rich in vitamin C, which stimulates the production of collagen (principle skin protein) and in lycopene, which works to combat the harmful effects of free radicals. Extraction: this natural perfume is harvested from the Japanese Cherry Blossom which has a distinct sent certified by Ecocert. Benefits: its aromatic properties help to revitalize, focus, calm and restore the body. The Japanese Cherry Blossom is renown for its high content of antioxidants and essential fatty acids. It also has moisturizing and nourishing properties. Benefits: it is used as an antiseptic, astringent and solvent. In our formulations, it has a negligible presence at the end of the INCI list, guaranteeing its benefits for the skin. Extraction: colorless oily liquid with a light floral scent with hints of rose that occurs naturally in some plants. It is a monoterpene that is part of the natural essential oils. Benefits: it forms part of the natural fragrances found in cosmetics and personal care products. Extraction: It is a monoterpene that is found in natural essential oils. It is found naturally in plants such as geranium and lemon. Benefits: it is widely used as an ingredient of fragrances due to its rose-like scent. It is also used in many products to generate grapefruit, plum, pineapple, peach, lemon and cranberry scents. Apply to wet skin after usual shower routine. The fine-grained exfoliating particles make the scrub safe to use on the face as well. ALMOND OIL Stimulates collagen production. Almond Oil hydrates with a rapid absorption, leaving your skin smooth. As an antioxidant with a high content of Vitamin E, Almond Oil also stimulates the production of collagen. JOJOBA OIL Provides elasticity, softness and firmness to skin. RASPBERRY SEEDS Biodegradable exfoliating particles. BAMBOO POWDER Improves cell renewal. BURDOCK Depurative and detoxifying action. Apply the Detox Revitalizing Body Scrub to hands. 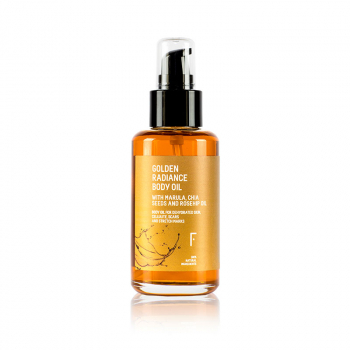 Rub all over body in gentle movements moving up and down to eliminate impurities and stimulate blood circulation. Avoid exfoliating the most delicate areas of your body. Let the natural oils absorb for 30 seconds. Rinse with plenty of water. Make this body exfoliation ritual once to twice a week.